Brock Lesnar (Pictured) has never been shy about expressing his love for hunting. In fact, the former UFC heavyweight champion released a video this past August announcing his return to the Octagon while lighting up countless prairie dogs with a semi-automatic weapon. Unfortunately for Lesnar, a November 19, 2010 escapade in Alberta, Canada has reportedly landed him in some hot water. According to the Edmonton Journal, Canadian wildlife officials are accusing the 34-year-old of shooting a mule deer buck but only keeping the head as a trophy. Lesnar, along with a hired guide, have each been charged with three counts; leaving meat to rot, improper tagging and illegal possession of wildlife. Lesnar was reportedly scheduled to appear in a Medicine Hat, Alberta court Friday to address the charges, but the proceedings were adjourned until January 19th. The offenses reportedly carry a maximum penalty of $50,000 and one year in prison for each count. In the meantime, the former WWE superstar has much bigger fish to fry. 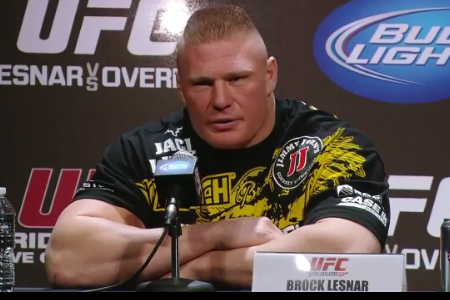 Lesnar is slated to face Alistair Overeem in a heavyweight top contender bout at UFC 141 on December 30th.